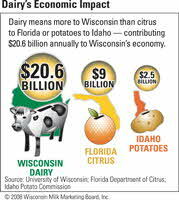 Did you know that the impact the dairy business in Wisconsin has on the state's economy is more than twice that of the citrus industry's impact on Florida's economy and nearly nine times the economic impact as Idaho's potato industry? Dairying in Wisconsin is not just another industry among many, but the industry that's made Wisconsin famous. It is the one industry that defines us in the eyes of our fellow Americans and in the minds of people from around the world. Wisconsin has been an international leader in dairy and cheese technology for more than 150 years. How long has dairy farming been important to Wisconsin? Dairy farming and cheesemaking date back more than 160 years, before Wisconsin was even granted statehood in 1848. In fact, Wisconsin's first cheesemakers were farm wives who, in the 1830s, began making cheese in their kitchens as a way of storing excess milk. Wisconsin's first cheese "factory" was started by Anne Picket by gathering milk from her south-central Wisconsin neighbors and producing cheese for all to share. By 1900, Wisconsin had become a powerful player in cheese production nationally and, by 1920, was the nation's top producer. Today, about 90% of Wisconsin cheese is sold outside the state's borders. Wisconsin is home to more dairy farms than any other state— nearly 14,000 dairy operations (about 20 percent of the nation’s total) caring for over 1.25 million dairy cows. The Badger State ranks first in the number of organic and grass-based dairy farms. Wisconsin leads the nation in the number of on-farm bio-energy technology installations which converts animal waste to "green energy." Wisconsin leads the country in the number of cheese plants (136), and Wisconsin is No. 1 in overall cheese production. The state's cheesemakers produce more than 2.4 billion pounds of cheese annually, 26% of the nation's total. Cheesemakers in America's Dairyland produce more specialty cheeses - such as Asiago, Edam, Gorgonzola and Havarti - than any other state. This is a positive trend for Wisconsin because the market for specialty cheese is growing significantly. In 1993, Wisconsin produced 83 million pounds of specialty cheese. By 2005, that number had more than quadrupled to 355 million pounds, a 328% increase. The state is home to more than 1,200 licensed cheesemakers and is the only state with a Master Cheesemaker® Program, a sign that cheesemakers are committed to reinvesting in expertise. 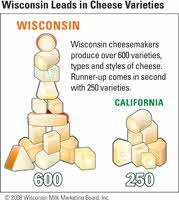 Wisconsin is home to cheesemakers who continue to win more awards than any other state or country. 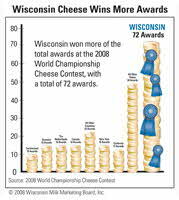 At the March 2007 United States Championship Cheese Contest, Wisconsin cheesemakers garnered 89 awards including 60 percent of the Best of Class Awards—six times as many as any other state! Wisconsin cheesemakers built on tradition at the 2008 World Championship Cheese Contest by once again winning the top number of awards of any state or nation in the competition, claiming 72 awards, 27 of them Best of Class. Some of the world's leading dairy-related companies — employing thousands of residents—are headquartered here in the Badger State, including Foremost Farms USA, ABS Global, Westfalia Surge Technologies, Alta Genetics, Chris Hansen, Inc. and Holland Manufacturing, to name just a few. Thanks to the University of Wisconsin System, our state is also home to some of the country's top dairy scientists, researchers and technology experts. Being "America's Dairyland" is more than mere numbers, however. The dairy business is central to our past, an important component in today's state economy and vital part of our future. Contrary to popular belief, the vast majority of dairy farms in Wisconsin are still family owned and operated. However the business structures that define the operation may look quite different than the single proprietor farm of two decades ago. It may mean that two or more families are combining resources under a new business structure to provide for a new generation of multi-family dairies. Or it may mean that parents and their children are establishing a working plan for an orderly succession that positions the business for long-term success. These are just two of the many examples of Wisconsin farmers applying solid business principles to their operations to preserve the viability and profitability of their farms for generations to come.